The last time there was this much buzz about a book that you couldn’t actually hold in your hands yet, it was probably book 4 of the Harry Potter series. And while The Legal Genealogist (and other genealogists, I’m sure) all carefully noted clues to Harry’s — and Voldemort’s — family trees, there probably wasn’t a whole lot in that book of immediate use to a family historian. 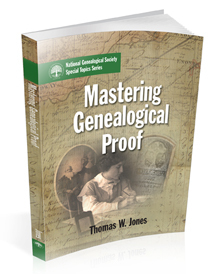 That surely won’t ever be said of Mastering Genealogical Proof, the upcoming title by Thomas W. Jones, Ph.D., CG, CGL, FASG, FUGA, FNGS.1 He didn’t earn all those initials after his name by anything less than stellar performance, and now he’s sharing his expertise to help the rest of us begin to rise to his level. As a unique textbook on genealogical methods and reasoning in the twentyfirst century, Mastering Genealogical Proof guides readers in acquiring genealogical skills transcending chronological, ethnic, geopolitical, and religious boundaries. In other words, this is the ultimate how-to-do-genealogy-right book. Already, there are plans for two separate intensive programs for researchers to work their way cooperatively through the book’s lessons. Angela Packer McGhie, administrator of the ProGen Study Program, has announced that she will be organizing study groups around the new book.3 Watch for announcements on her Adventures in Genealogy Education blog. So how do we actually get our hands on this book? First, if you’re not going to be at the National Genealogical Society’s conference in Las Vegas May 8-11, you can preorder it directly from NGS for shipment about 20 May 2013. The price is $30 for the general public and $25 for NGS members. (Log in as a member before ordering if you’re a member.) Information on the book and a link to the preorder page are on the NGS website here. Second, folks who are attending the NGS Conference will be able to buy it (and, if Tom’s hand holds out, even get it autographed) at the conference. The member discount will be available to NGS members there as well. It’s a sure bet I’m going to be one of the first in line to get my copy. My budget is so trashed for the coming month – and so worth it! Hope you manage to get his autograph on your copy, Judy. Enjoy! I will be 2nd. in line! I remember Dr. Jones mentioning his new book last October at the British Institute. I can’t wait, I can’t wait, I can’t wait! Now, now, let’s not cut in line, here. I’m sure they’ll have enough to go around! And I know for sure that Tom’s great book has already attracted at least one order from across the globe! Not telling, but it’s a legal guess …. I just hope NGS has a big crew scheduled to work the lay-down/ship-out day!